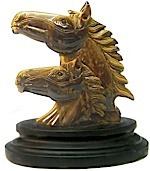 Item #FP-HRS-70: Average 4.75"x3.25"x 3.5" tall, Ironwood Box featuring a carved Horse Head on removable lid. 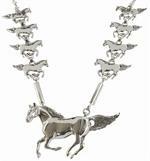 Item #GSNM-NK-100: 26" Sterling Silver Multi-Mustang Necklace of 55.24 grams with one 2 1/2" long mustang and eight 1 1/4" long mustangs; Hook clasp. 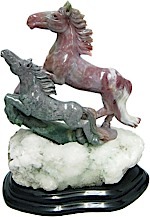 Item #JP-H10: Approximately 7.75"x9.75" tall, Bloodstone and Fancy Jasper Horses. Mounted on Black Basalt base. Item #LR-12576: 3/4" x 1" long 14Kt. 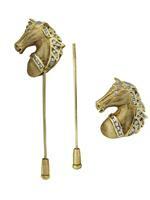 matte Yellow Gold Horse Stick Pin/ Slide Pendant with twenty-eight Round Diamonds of .46 cts. TW pavé set in White Gold. 2" long 14Kt. Yellow Gold screw top stick pin and cap. Item #SC-PTDA-23: 14Kt. Yellow Gold Horseshoe Tie Tack with eleven pavé set Round Diamonds of .07 cts. TW. Item #FP-DK-70: Average 4.75"x3.25"x 3.5" tall, Ironwood Box featuring a carved Duck on removable lid. 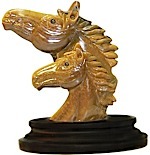 Item #JP-PCH-15: 10.5"x3"x6.5" tall Peach Calcite Horses. Cream with dark Brown and Pink Matrix. Carved as one piece. 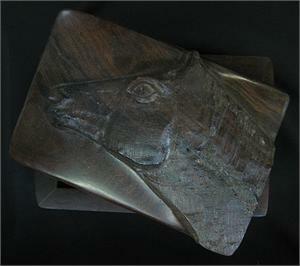 Mounted on a Black Basalt base. Item #D&R-32471: 3/4" x 3/4" 14Kt. Yellow Gold Horseshoe Pendant with seventeen channel set Gemstones including Peridots, Citrines, Garnets, Amethysts, Iolites and Blue Topaz of 2.76 cts. TW. 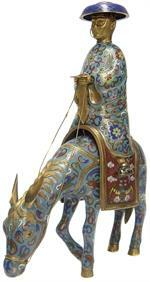 Item #SOH-12: 5 1/2" white or dark gray small Soapstone horse in various running poses. 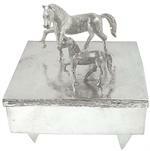 Item #SS-1373: 4x4" wide x 2 1/8" tall Sterling Silver hinged Box with Horse accents of 306.24 gms. T.W. Item #GSNM-P-101: 2 1/2" wide Sterling Silver Mustang Brooch of 19.18 grams. Item #GSNM-MUS-8: 5/8" wide Sterling Silver Mustang Circle Earrings; Shepherds' hooks. Item #GSNM-MSB-23: 2" long Sterling Silver Mustang Brooch of 8.30 grams. Item #GSNM-TWH-11: 1.375" tall Sterling Silver Tennessee Walking Horse earrings with shepherd's hooks.